What Will I Learn in My Online Master’s in Literacy Education Program? Do I Need to Take the GRE to Enroll in an Online Master’s in Reading Education Program? Reading forms the foundation for most types of learning. Thus, schools across the country make a concerted effort to improve early literacy skills and help struggling readers of all ages. Teachers who specialize in literacy not only impact individual students with their expertise, but they also act as a resource for other teachers across their school district. Adult learners enrolled in remedial college classes, English as a second language (ESL) programs, or general education diploma (GED) preparation programs also benefit from working with a trained literacy teacher. The field is growing steadily, with the Bureau of Labor Statistics reporting a 7% projected increase in employment of curriculum coordinators through 2024. A master’s degree in literacy education prepares teachers to work as reading coaches, instructional designers, and teaching mentors. Struggling readers often face numerous challenges, from learning disabilities to limited vocabularies to a lack of encouragement. Literacy programs offer strategies to overcome these barriers and help students gain important reading skills. Many states require students to hold a master’s degree before granting certification to teach in the field. Colleges may also require teachers to have a minimum amount of teaching experience before enrolling in a master’s in reading education program. Additional Considerations In addition to a master’s degree, a state license or teaching endorsement may be required for employment in the field. Some states also require potential workers to pass an exam. UT Tyler, part of the University of Texas System, operates a main campus in the East Texas city of Tyler, along with secondary campuses in Longview, Palestine, and Houston. The school offers a master of education in reading that also includes a reading specialist certificate. Candidates in the program develop the skills to offer specialized reading support to students, gaining knowledge of literary assessment and instruction, research methods, and coaching strategies for adolescent and adult learners. Graduates who earn their master's in reading through UT Tyler are prepared for specialized careers as literacy coaches, instructional support teachers, intervention specialists, and reading specialists. The degree requires 30 credit hours to graduate and offers start dates in the spring and summer. Applicants must possess a valid Texas teaching license, which can be in any subject. The program can be completed entirely online. Greenville, North Carolina, is home to East Carolina, a public college that offers some of the most affordable online programs in the state. ECU’s master of arts in education – reading education degree, open to licensed teachers only, covers the assessment and diagnosis of reading problems along with the design and supervision of literacy programs that address those problems. In addition to core courses in education theory and reading instruction, the curriculum also includes an action research project that has students independently investigate an area of academic interest. The program also includes interdisciplinary electives, allowing students to select nine of their credit hours from a related field, such as gifted education, library science, ESL, or literacy/technology integration. Students pursuing the 39-credit online master's degree in reading and literacy typically complete the program within 2-3 years of part-time study, with most maintaining full-time teaching positions. Serving around 6,000 students from its main campus in Williamsburg, Kentucky, UC is a private, religious school associated with the Southern Baptist Convention. Since its founding in 1889, the college has cultivated goals of flexibility and value, so it’s no surprise that UC boasts some of the cheapest online education programs in the state. The school’s master of education in literacy specialist trains students to work with reading and writing at all grade levels, focusing on skills in leadership and education content. The program requires students to earn 30-hours. The master's in reading stresses the areas of differentiated instruction, reading interventions, and the development of student reading and writing plans. Graduates also receive a literacy specialist P-12 endorsement, preparing them to work as literacy teachers, reading coaches, resource teachers, and mentors for reading and writing. The curriculum includes nine hours of foundation courses, 15 hours of specialization courses, and six hours of professional courses, emphasizing reading and teacher leadership. Morningside is a private liberal arts college associated with the United Methodist Church, and the school’s campus in Sioux City, Iowa, has served Christian students for more than a century. The master of arts in teaching: reading specialist degree prepares graduates to serve as literacy leaders in elementary and secondary schools. Combining skills of reflective thinking, research methods, and the use of technology, the degree consists of two primary components: a nine-credit educational foundations core and a reading specialist endorsement. The foundation core includes fundamental knowledge in education research, data collection, and interpretation, while the specialist endorsement meets standards established by the Iowa Board of Educational Examiners and the International Reading Association. While all courses for the degree are available fully online, students must perform three local practicum experiences at grade levels K-4, 5-8, and 9-12. The program is only available to licensed teachers. Established in 1906 as an agricultural and mechanical school, UWG has maintained a focus on accessible education, and the school ranks as one of the most affordable in Georgia. UWG’s master of education in reading instruction features a curriculum based on standards from the National Council for Accreditation of Teacher Education and the International Reading Association, giving students a deep understanding of instructional practices, research, and theories of literacy. The degree emphasizes reading, writing, speaking, and listening. Students explore the effects of these practices on children’s educational development. Students also gain strategies for encouraging inquisitive learning and critical thinking in children through collaborative interactions in reading and writing. This 30-credit program is only open to students who possess or are eligible for a level-four teaching certificate. Graduates are also qualified to test for a reading specialist endorsement, though it is not required. Sam Houston, one of the oldest public colleges in Texas, was founded in 1879 in Huntsville, about 70 miles north of Houston. The school’s master of education in reading/language arts is designed for practicing teachers and other education professionals, preparing graduates to become effective reading instructors and literacy advocates for K-12 students. Along with core courses in literacy theory, language arts, and instruction strategies, the program includes a capstone field internship course, allowing students to gain hands-on experience designing and implementing reading curriculum. The program also prepares students to test for the Texas reading specialist certification; candidates must have a valid elementary or secondary teaching license and at least two years of teaching experience to sit for the exam. The 36-credit master's in reading program is available exclusively online and features three start dates throughout the year. MSU is the second-largest college in Missouri, serving more than 22,000 students through a main campus in Springfield, satellite locations in West Plains and Mountain Grove, and an international campus in Dalian, China. Students in the school’s master of science in education, literacy program learn practices for teaching literacy to K-12 students, preparing them for positions as teachers or literary coaches at title-one schools. The degree requires students to earn 37 credit hours. The program includes courses in assessment procedures, curriculum design, research methods, and more. Students end the program with a research seminar and a comprehensive independent thesis project. Graduates receive Department of Elementary and secondary education special reading teacher certification for K-12 students, though students must possess another teaching certification to qualify. MSU also offers an accelerated bachelor’s-master’s program that allows students to take master’s level courses earlier and earn both degrees faster. UND, located in Grand Forks, North Dakota, is the oldest and largest college in the state, with an annual enrollment of about 15,000. The school offers their in-state tuition rate to all online students regardless of location, making UND an affordable option for learners across the country. UND offers two literacy graduate programs: a master of science or a master of education in reading education. Both programs train students to develop effective instructional practices for reading and language arts. The master of science focuses more heavily on the systematic study of reading practices to improve teaching and learning. Students in both tracks learn to meet the needs of diverse student groups and advocate for literacy programs in schools. Both tracks also include a supervised practicum that allows students to develop professional experience in a classroom setting. Graduates are also prepared to sit for the North Dakota reading credential exam. Based in Pensacola, Florida, UWF maintains several satellite locations throughout the state, along with a significant online program. The school’s master of education in reading focuses on the intersection of contemporary literacy research and classroom practices, encouraging educators to develop their own instructional strategies while also developing specialized knowledge in areas of reading leadership. The program operates in a cohort model. New cohorts begin in the summer and fall of each school year. UWF students perform several hands-on field experiences, which online students can arrange locally through the Department of Teacher Education and Educational Leadership Office of Field Placement. Florida students can earn the state K-12 reading endorsement and reading certification upon graduation, but residents of other states should check with their local licensing agency to see if UWF’s master's in reading program meets state requirements. Northeastern State, founded in 1909, is the oldest college in Oklahoma and one of the oldest colleges in the Midwest. Along with a main campus in Tahlequah, the school also operates auxiliary campuses in Muskogee and Broken Arrow, along with a robust online program. The master of education in reading at NSU is an interdisciplinary degree that encompasses strategies for early education, special education, and general teaching. The program emphasizes the development of the reading process, examining the factors that affect children’s ability to read and write. Students gain advanced skills in instruction, reading assessment, and curriculum development through a curriculum designed in accordance with the International Reading Association’s competency standards. The degree also includes a practicum experience that takes place within a supervised group setting. NSU’s online master's degree in reading and literacy meets Oklahoma State Objectives for Reading Specialists, and students are prepared to take the state certification test upon graduation. UNC, one of the largest colleges in North Carolina, operates three campuses across the city of Charlotte, serving more than 28,000 students annually. Students earning their master of education in reading education at UNC take advantage of a streamlined 33-credit program that can be completed part-time through fully online classes. Applicable to K-12 teaching, the degree integrates training for all subject areas, grade levels, and ability levels, giving students the skills to work with a range of readers. The program also emphasizes the integration of technology and writing, offering a curriculum that translates the latest theories of literacy into practical classroom instruction strategies. Students complete four distinct phases arranged around four academic areas: foundations of literacy and technology, expanding content and pedagogical knowledge, developmentally appropriate assessment and instruction, and reflective leadership. The master's in reading program is also designed to meet the needs of English language learners. Founded in 1868, MNSU evolved into a teacher’s college before finally becoming a state university, and the school maintains a focus on innovation in its education program. MNSU’s master of science in reading is a unique degree that emphasizes cultural and linguistic diversity in reading instruction, preparing students to meet the needs of all styles of learners. The curriculum focuses on literacy advocacy at the classroom and district level, making the degree applicable to teachers and administrators. Based on the latest development in literacy theories and practices, the program trains students to devise, implement, and evaluate reading programs for K-12 students. Students take unique courses that cover areas including response to intervention, content area reading instruction, leadership in reading, and the link between assessment and instruction. The master’s in reading program also includes a practicum that has students administer reading assessments and use the results to develop a reading curriculum for students. UAB, part of the University of Alabama System, is a public research college that serves around 18,000 students from a main campus in Birmingham. The UAB master of arts in education in reading trains students to serve as K-12 reading specialists, emphasizing subjects in language arts, language development, literature, reading assessment, and curriculum development. Students in the program complete a survey of special education coursework that includes an introduction to exceptional learners. The online master's degree in reading and literacy also includes an internship in remedial reading, allowing students to gain supervised experience in a classroom setting. The program is only open to teachers who possess a valid Alabama, bachelor’s-level professional educator certificate, at least two years of classroom teaching experience, and documentation of at least two previous reading courses, including one in introductory reading. JSU, founded in 1877, is a historically black college and university based in Jackson, Mississippi. The school’s student body of more than 10,000 makes it one of the largest historically black colleges in the country, and JSU also ranks as one of the most affordable schools in the state. The master of science in reading education is a research-based degree that emphasizes data collection and analysis in the service of effective reading instruction. Students gain skills in formal and informal reading assessment, learning to use individual and group data to guide program development. The degree also builds skills in diagnosing reading deficiencies and devising optimum solutions to foster student development. In addition to online courses, students also perform two supervised reading practicums in a classroom environment. Admission to the program requires three comprehensive exams, including the JSU graduate english competency examination, the PRAXIS II reading specialist exam, and the JSU graduate area comprehensive examination (taken after students have completed 24 credit hours). Fresno State, a member of the California State University system, sits in the San Joaquin Valley near the Sierra Nevada mountains, serving around 24,000 students annually. The college’s master of arts in education with a reading/language arts option offers advanced training in reading assessment. The program prepares students for positions as teachers, diagnosticians, educational literacy consultants, and supervisors in a variety of educational settings, from K-12 schools and reading clinics to community colleges. Students gain the skills to develop reading curriculum and educational programs that meet the needs of different learners, with special attention to diverse language backgrounds. Offered in a 30-credit, five-semester format, the master's in reading program begins each fall with a cohort of students who move through the curriculum together. Students have three options for their capstone experience: a research thesis, a graduate project, or a comprehensive final exam. UGA, founded in 1785, was the country’s first state-chartered college. The school continues that tradition of accessible education by offering affordable degrees to on-campus and online students. UGA offers a master of education in reading education with an emphasis in new and digital literacies, focusing on core knowledge in research-based instruction, research methodologies, and the cultural and historical foundations of literacy. The new and digital literacies emphasis includes four specialized courses that address the role of technology and digital media in the classroom and the effect of these tools on the conception and development of literacy. Students gain strategies for integrating digital resources into literacy curriculum and addressing the role of popular and digital culture in the classroom. The online master's degree in reading and literacy culminates in a capstone course that focuses on electronic assessment in literacy classrooms, along with a multimedia final examination. Based in Spring Arbor, Michigan, SAU is a private Christian college associated with the Free Methodist Church. The school is home to more than 3,000 students, making it one of the largest Evangelical colleges in the state. SAU’s master of arts in reading prepares students to devise, implement, and support literacy initiatives for grades K-12. Students in the program gain an overview of literacy research, theories, methods, and teaching strategies, building the skills to develop a reading curriculum that serves the needs of diverse student populations. The online master's degree in reading and literacy also includes an action research component that has students collect and analyze data to make recommendations for literacy program development. The program curriculum is completely online, with 12 total courses that can be completed in 24 months. Graduates who are already certificated teachers can also test for the Michigan reading specialist endorsement. UA offers a master of education in reading program with three options: a standard reading degree, a reading specialist degree, or a reading specialist and dyslexia therapist degree. The standard degree is a 30-credit program designed for students who are interested in literacy training but don’t want to become school reading specialists. Students can choose from three concentrations within the program: dyslexia therapist, intervention, or literacy and culture. The 36-hour reading specialist degree trains students to serve as certified school reading specialists, also preparing them for the state-required Praxis reading specialist exam. The reading specialist and dyslexia therapist program is also 36 credits and prepares students for the Praxis reading specialist exam and the dyslexia therapist exam. All three of the online reading master's programs at UA are offered in an accelerated format that also includes three supervised practicum experiences. UNI, based in Cedar Falls, Iowa, offers a master of arts in education in literacy education that integrates research and theory along with classroom practice. The program prepares students to engage learners and help them develop strategic processing and critical thinking skills. Students move through the curriculum in a cohort format. The degree uses interactive video conferencing technology that allows students to communicate and collaborate. Other courses use an asynchronous platform that allows students to complete work at their own pace. The UNI master's in reading also offers three options for students seeking a state reading endorsement: reading education for grades K-8, secondary reading for grades 5-12, and reading specialist K-12. The K-8 endorsement pathway is available entirely online, the other endorsements may require some campus courses. The degree is designed for practicing teachers and can be completed with three years of part-time coursework. With more than 11,000 students, UMaine is the largest college in the state of Maine, and its campus in Orono has served students since 1868. UMaine’s master of education in literacy (writing and the teaching of writing) is an innovative hybrid program that focuses on the relationship between reading, writing, and teaching. Students can choose from a range of subjects covering different facets of writing and education, including poetry, digital writing, nonfiction, blogging, writing center pedagogy, and more. The degree also includes an online writing practicum that students complete under the supervision of a writing mentor. Rather than a thesis, students can choose to complete either a comprehensive paper, oral examination, project, or portfolio, intended to demonstrate mastery of the program’s learning objectives. The master's in reading program is a blended degree that combines online courses with summer sessions on the UM campus. USF, a public college located in Tampa, Florida, is home to more than 48,000 students, and the school boasts one of the cheapest online programs in the state. USF’s master of arts in reading stresses student and teacher literacies, classroom connections, literacy interventions, and the socio-cultural contexts for literacy development. Students gain an understanding of literacy strategies at the school, district, state, and even global level, preparing them to serve as teachers and literacy coaches. The program also emphasizes media literacy competency by training students to use tools used for video production, social networking, and educational gaming. Offered in a three-block sequence of courses, the program features several synchronous virtual classroom sessions that allow students to communicate and perform group work through video conferences. The program curriculum also prepares students to receive State of Florida certification in reading education; a non-certification option is available. IWU, an Evangelical college in Marion, Indiana, was founded in 1920 in association with the Wesleyan Church. The school offers a Christian liberal arts education to more than 15,000 students, making it the largest private college in the state. IWU’s master of education in technology/digital literacy degree integrates technical knowledge, design principles, and digital learning theory, preparing students to advocate for productive digital citizenship and decision making. Focused on instructional leadership strategies and digital media theories, the curriculum trains students to become more effective teachers who can implement technology and media into classroom instruction. This 18-credit program utilizes a cohort model that helps students build peer connections by completing all courses together in the same sequence. Applicants must have a valid state teacher’s license and at least one year of classroom teaching experience, and the degree typically takes about 24 months to complete. Marygrove, based in Detroit, Michigan, has provided Catholic liberal arts education to students since 1905. The college offers a master in the art of teaching with a focus on elementary reading and literacy, intended to train effective teacher leaders with strong content knowledge. Students in the program take six core courses focused on fundamental skills in instructional design, student assessment, evidence-based interventions, and meeting student needs. Students in the master’s in reading track then move on to specialized courses covering reading diagnosis, differentiated instruction, reading in content areas, and reading and writing connections. Before graduation, students complete a capstone course that can take one of three forms: a video self-analysis, a data-based action research project, or a self-assessment of teaching practices and philosophy. The curriculum requires five semesters of two courses each, with most students finishing the program in under two years. Carson-Newman, founded in 1851 in Jefferson City, Tennessee, is a Baptist liberal arts college with around 2,500 students. The school’s master of education in reading specialist degree trains literacy teachers who also serve as mentors and role models for students. Utilizing contemporary research and technology tools in the service of effective classroom instruction, the program also trains teacher to practice effective assessment strategies that meet diverse student needs and develop stronger overall relationships with families and communities. The online master's degree in reading and literacy has students complete one, three-credit course every eight weeks, allowing for completion of the degree in about five semesters. Carson-Newman also offers a blended degree that features one classroom meeting held at the same time each week. All applicants to the program must possess at least three years of classroom teaching experience and pass the Praxis reading specialist test. Old Dominion, based in Norfolk, Virginia, is one of the largest schools in the state, and its distance education system, ODUOnline, offers more than 100 online degree programs. The online master of science in education with a reading specialist concentration trains literacy coaches for the elementary and secondary levels. Many courses in the program can also be applied to ODU’s online literacy coaching certificate. The program focuses on the development of reading programs, the assessment of student reading abilities, and the delivery of professional development workshops. This 30-credit degree program combines synchronous and asynchronous online courses, with some classes requiring live video conferencing meetings. Students in the program also perform a supervised practicum, tutoring children in reading to gain professional experience in literacy assessment and remediation practices. Due to state restrictions, the program is not available to online students residing in Washington State. UM, located in Oxford, Mississippi, is the largest college in the state, serving a body of around 24,000 students. The master of education in literacy education degree at UM focuses on the varied roles of reading specialists. The curriculum has professional teachers build their skills in literacy instruction and prepare them for positions as literacy coaches, specialists, and literacy leaders for schools and school districts. This 36-credit program is offered in a blended format that combines online courses and some regular campus meetings. The scheduling is designed to meet the needs of practicing teachers, with campus courses held in the daytime during the summer semesters and in the evening the rest of the year. Applicants to the master’s in reading program must hold an educator licensure and take the Praxis II content exam. Saint Leo, founded in 1889, is the oldest Catholic university in Florida and one of the state’s earliest adopters of online education, offering courses since the 1990s. The school’s 36-credit master of education reading concentration program is available fully online and can typically be completed within 24 months. The master’s in reading curriculum also fulfills requirements for Florida’s K-12 reading certification and reading endorsement. Students gain the skills to develop integrated language arts programs and apply current research, theories, and instructional strategies to advanced literacy teaching. The curriculum covers major topics in curriculum development, reading assessment, cross-cultural communication, language acquisition, and educational research in policymaking. Students in the program gain professional experience through a literacy practicum that has them perform supervised field work in a K-12 classroom. Online students can still participate in the campus community through membership in Future Teachers Association and the International Honor Society for Educators, Kappa Delta Pi. As one of the oldest members of the State University System of Florida, UF’s origins date back to 1853, and the college has operated in its current location in Gainesville since 1906. UF offers two literacy graduate programs: a master's of education in reading and a master of art in reading education. Both programs focus on the development of literacy programs that promote academic success for K-12 students, covering similar course topics in language arts, literature, reading assessment, and language acquisition. The master of education is a 36-credit degree that does not require a thesis and prepares students to test for Florida State reading certification. The 30-credit master of art degree does require either a thesis or culminating project and does not result in state reading certification. Both programs are available fully online and can typically be completed within 4-5 semesters of study. Park, a private college based in Parkville, Missouri, operates several additional campuses around the country, including two in the Kansas City area and one in Austin, Texas. Park offers a master of education in language and literacy with two available tracks: special reading teacher or English language learners teacher. The reading teacher track focuses on best practices for encouraging literacy development, leading to Missouri Special Reading certification. The English language learners track trains students in language acquisition strategies for reading and writing, leading to Missouri English language learner certification. Both tracks are intended for teachers who are already certified in another content area. The online reading master's programs at Park are offered in either an online format or a cohort model that meets once a week at an off-campus location. The curriculum has students complete one course every eight weeks, with makeup options available if scheduling conflicts arise. Edinboro, founded in 1857 as a teacher’s college, still maintains a focus on education programs, and the school ranks as the largest and most comprehensive in Northwestern Pennsylvania. The college’s master of education in reading stresses developmental and interventional reading strategies in K-12 schools, giving student teachers the skills to diagnose and address reading disabilities. This 30-credit program covers topics including research design in reading, language arts instruction, English language learning, and reading program organization. Students can take advantage of a primary online format that can be completed in 20 months, with a schedule designed to accommodate working teachers. Students take online courses during the fall and spring semesters, with a summer Reading Clinic that allows for face-to-face interactions with peers and instructors on campus. Program graduates are prepared to sit for the PRAXIS II reading specialist exam, which qualifies them for the reading specialist certification in Pennsylvania. Black Hills, one of the largest public colleges in South Dakota, enrolls more than 4,500 students annually through its campus in Spearfish. BHSU’s master of education in reading is a K-12 reading specialist program based on the International Reading Association’s criteria for literacy coaches and reading specialists. The program prepares students for literacy leadership roles at the elementary, middle, and high school levels. The curriculum also stresses comprehensive clinical education. Black Hills works with school districts to provide extensive professional experience to literacy instructors. Most candidates for the program are teachers who want to enhance their classroom practice by adding a reading specialist designation to their teaching credentials. After graduation, most remain regular teachers who can better facilitate student reading development through the added knowledge of this advanced degree. Concordia, located in Seward, Nebraska, is a private college affiliated with the Lutheran Church-Missouri Synod. Serving around 2,600 students, the school also operates a graduate school in the nearby state capital of Lincoln. The school’s master of education in literacy with reading specialist and ESL emphases is a unique, versatile degree that gives students two professional emphases through an interdisciplinary, integrated curriculum. The program combines topics of linguistics, language acquisition, cross-linguistic differences, and bilingualism and biliteracy. Students also gain foundational knowledge of educational theory, research evaluation and design, the psychology of teaching, and literacy assessment, preparing them for leadership in K-12 ESL/ELL classrooms. The 51-credit program includes an ESL practicum and a field case study, allowing students to gain hands-on experience. Courses are arranged in 8-week blocks, with 17 courses required for graduation. UW - La Crosse, located in Wisconsin, is one of the most comprehensive members of the University of Wisconsin system. For students seeking an online master's degree in reading and literacy, UW offers a master of science in education – reading with several options, including reading teacher certification, reading specialist certification, or a non-certification program. Students gain expertise in several areas, including developmental reading, assessment and instructional techniques, language development, learning disabilities, content area reading, and literature for children and adolescents. The reading teacher certification track requires 30 credit hours, and prepares students for classroom literacy instruction. Students can also combine both the reading teacher and reading specialist certifications for a 37-credit degree. The non-certification track also requires 30 credit hours. Regardless of specialization, students end the program with a supervised teaching experience and a comprehensive master’s thesis exploring an issue related to literacy. Northern Michigan, a public college in Marquette, Michigan, is known for its integration of educational technology. NMU’s masters of arts in education reading specialist is a 37-credit degree that prepares students to become certified reading specialists. The program includes foundational courses in educational research along with a range of concentration courses. Concentration include young adult literature, teaching language arts, diagnosis of reading disabilities, and the organization and supervision of reading programs. Students also gain professional experience through a supervised clinical practicum, which has them manage a reading program to diagnose and treat remedial readers. The program culminates with a 2-8 credit thesis option that has students perform original research in a literacy topic with the approval of a thesis committee. Graduates of the online master's in reading program are also prepared to take the subject test for the Michigan reading specialist endorsement. EKU operates a main campus in Richmond, Kentucky, along with six other branch campuses around the state. The school has more than 40 cheap online degree programs. 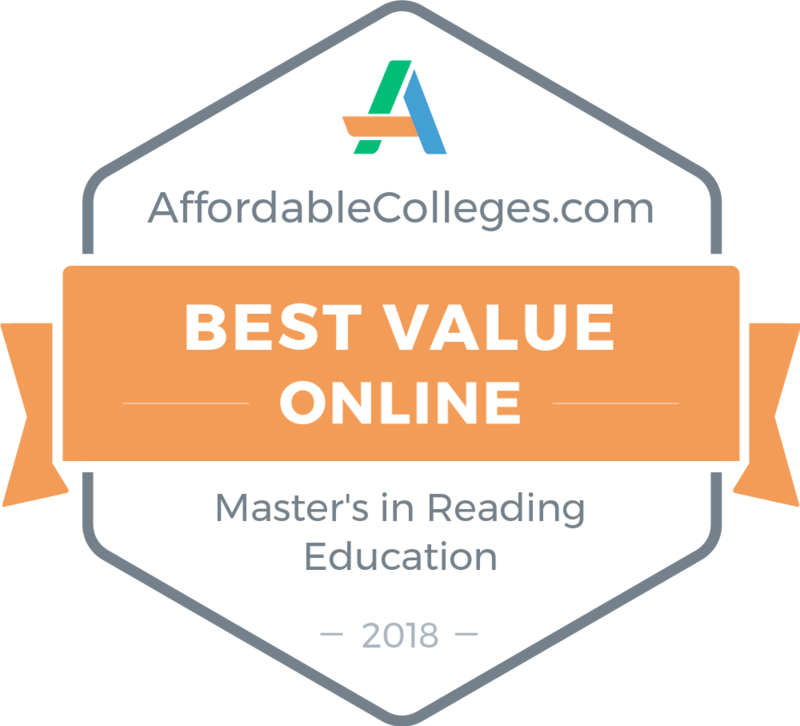 Open to certified K-12 teachers, the master of arts in education in literacy features an accelerated online format that allows students to finish in one year. The degree prepares students for classroom instruction and the implementation of school-wide literacy initiatives, serving as teacher leader educators or reading specialists. The curriculum requires 30 credit hours to graduate and includes 15 credits of teacher leader core courses and 12 hours of literacy education, focusing on reading instruction and the development of literacy programs. Students end the course with an action research project in a literacy topic, which leads to a technology presentation in a capstone seminar. Program graduates are prepared to test for the Kentucky literacy P-12 endorsement and the Kentucky teacher leader endorsement. Part of the Concordia University System, CUW is a Lutheran liberal arts college located in Mequon, Wisconsin, that offers religious-centered education to students of all backgrounds. Concordia’s master of science in education in literacy explores the connections between reading, writing, listening, and speaking, highlighting their link to the development of literacy in K-12 students. The program draws on research and theory to give students a range of classroom instruction and literacy assessment strategies that match children’s educational needs. In addition to courses in literacy and instruction, the curriculum includes an experience-based practicum and a comprehensive portfolio that demonstrates student understanding of program standards. Students also complete a capstone course that explores relevant professional issues in administration, curriculum, evaluating planning, and organization. The standard degree curriculum qualifies graduates for Wisconsin reading teacher licensure, while an additional three-credit course leads to Wisconsin reading specialist licensure. Founded in 1893, ESU is a public college based in Northeastern Pennsylvania with a student body of around 7,000. The master of education in reading trains teachers to meet the modern challenges of literacy development, with an eye toward common core standards and principles of literacy acquisition, assessment, development, and instruction. The program, organized around practices of professional development, encourages students to strengthen instructional reading skills, develop leadership, and utilize research-based methods for improved classroom teaching. The 36-credit online master's degree in reading and literacy can be completed within one year and features synchronous and asynchronous course material. This allows students to take advantage of live interactions with faculty and peers but also complete assignments on their own schedule. Graduates are eligible for Pennsylvania reading specialist certification, and out-of-state students may also be eligible for certification in their state of residence. Based in New Wilmington, Pennsylvania, Westminster is a small liberal arts college associated with the Presbyterian Church. The school offers a master of education in special education and reading specialist, preparing graduates for special education work with K-8 students and reading specialist work with K-12 students. The program emphasizes the attitudes, knowledge, and skills required of reading specialists, cultivating professional standards, ethics, and a sense of service among students. Rooted in experiential learning, the master’s in reading program includes a range of simulations, fieldwork, and embedded practicums, allowing students to develop their skills through actual teaching and tutoring work. This comprehensive degree requires 36 credit hours of coursework along with an action research project and successful completion of Pearson and Praxis professional certification exams. The program is available fully online, and students may also be eligible to participate in an off-campus cohort depending on location. Western Kentucky occupies a hilltop campus in Bowling Green that serves more than 20,000 students. The school also operates several satellite campuses and a sizeable online program. WKU’s fully online master of arts in education in literacy education prepares students for leadership positions in the education and private sectors. Emphasizing the shared responsibility of students and teachers in the learning process, the program encourages lifelong learning and literacy practices. The master’s in reading is a 36-credit degree that focuses on professional education, literacy specialization, and a selection of electives that allow students to customize their degree. The curriculum also includes a three-credit supervised internship opportunity. Students can choose either a thesis or non-thesis (comprehensive literacy project) track; the thesis requires a presentation and defense, while the project requires a presentation followed by a questioning/discussion section. Based in Jackson, Mississippi, Belhaven has offered a liberal arts education with a Christian worldview since its founding in 1883. The college’s master of education in reading literacy prepares students to meet the challenges of modern literacy education, including the emphasis on standardized evaluation of academic achievement. Students gain the skills necessary for supervisory roles such as literacy coaches or specialists, working to improve individual student skills and school or district programs for literacy development. The 33-credit curriculum includes practicum field experiences and professional internships, allowing students to apply program learning to actual education environments. Unlike many master’s in reading degrees, the Belhaven program prepares students for positions at the K-12 level, but in colleges as well. Graduates may find work as college remedial reading specialists or go on to pursue a doctorate in reading. Hamline, founded in 1854, is the oldest college in Minnesota and one of the oldest coeducational colleges in the country. The school serves around 5,000 students, allowing it to maintain a student-to-faculty ratio of just 13:1. Hamline’s master of arts in literacy education gives students a foundation in modern theories of literacy and literacy education. It builds learner’s skills across varying reading levels, academic subjects, and social and cultural backgrounds, including critical and digital literacy. The degree provides an in-depth understanding of the development and instruction of literacy in varying contexts. Hamline’s online master's degree in reading and literacy requires 34 credits to graduate and can be completed in approximately 24 months. Online students start each spring. Learners who demonstrate an outstanding history of academic achievement or other accomplishments related to education and literacy may qualify for a $1,500 literacy education scholarship. CU-Chicago is a Lutheran liberal arts college based in River Forest, Illinois, and a member of the Concordia University system. CU’s master of arts in reading specialist K-12 gives students a theoretical and practical understanding of literacy instruction, based in the latest research and teaching methods. Students learn skills and competencies necessary for advanced literacy instruction. The 30-credit program includes practicum experiences at the elementary and secondary/upper levels, preparing students for work at all levels of K-12 education. Students receive an overview of the current challenges facing literacy instruction in the country, gaining perspectives in individual student instruction and overall education policymaking. By the program’s end, students synthesize reading pedagogy, curriculum, teaching, and organization into a cohesive educational practice, preparing them to advocate for literacy in and outside of the classroom. Founded in 1922 by the Catholic Sisters of Notre Dame, NDC provides religious liberal arts education to a small student body of around 2,200, with a main campus in South Euclid, Ohio. NDC offers an online master of education with a specialization in reading, integrating the latest research, theories, and practices of literacy and instruction. The curriculum includes core courses in education, research courses focusing on design and a individual student project, and specialized courses for licensure/endorsement in reading. The reading endorsement emphasizes instruction across subject areas and the effective diagnosis of reading problems, with additional courses in language development, research applications, and theoretical model approaches to literacy. NDC’s online master's degree in reading and literacy also includes a three-credit reading practicum that allows students to apply program learning to actual classroom instruction and tutoring. OU, established in 1803, is one of the oldest colleges in the United States, and its campus in Athens, Ohio, serves more than 40,000 students. The school’s master of education in reading encourages teachers to advance their understanding of language acquisition and reading development for K-12 instruction. This 35-credit online degree emphasizes data-driven decision making and research-based learning, giving students the skills to design reading programs that accommodate a range of learners. Along with core courses in child and adolescent studies, action research, and the sociology and politics of education, the degree includes specialized reading courses and a master’s research project. The project has students identify and research a literacy issue while synthesizing major program points through their research. The fully online master’s in reading program can be completed with three semesters of study, and graduates are also eligible to test for the Ohio state reading endorsement. UC, part of the University System of Ohio, was founded in Cincinnati in 1819, making it the oldest college in the city. The school is also a top midwestern institution, with more than 44,000 students enrolled through campus and online programs. UC’s master of education in literacy and second language studies explores the cultural, social, linguistic, and institutional factors that underpin literacy development. Students in the program can choose from four tracks: PK-16 literacy and learning Instruction, postsecondary literacy instruction, PK-12 teaching English as a second language, or adult/international teaching English as a second language. Students in each of the school’s online reading master's programs gain skills in curriculum design, reading assessment, instructional methods, and critical analysis of literacy and language research. The PK-16 track requires 45 total credit hours for graduation, while the other three tracks require 51 credits. Founded in 1932, SNHU has become one of the top advocates of online education in the country. The school has an online student body of more than 75,000. The college’s master of education in reading and writing specialist degree examines the intersection of reading, writing, speaking, and listening development, giving students an in-depth understanding of literacy support and assessment methods. The curriculum focuses on diverse instructional strategies that meet the needs of different learners across grade levels and content areas. Students take 11 fully online courses, covering topics in educational research, ethics and school law, factors of diversity, and learning through technology. The master’s in reading also includes a practicum in curriculum and instruction, which requires students to demonstrate educational leadership through the development of two education products or experiences. Application to the program is typically restricted to licensed K-12 teachers, though certain educational professionals may qualify depending on experience. Based in Buffalo, New York, Canisius offers a master of science in literacy education that emphasizes the varied roles of reading and writing and their ability to help children communicate, connect, and interpret information. Students in the program can pursue literacy certification for either grades PK-6 or 5-12, with both tracks highlighting issues in emerging literacy, teaching reading in classrooms of diversity, and the role of the literacy specialist. The master’s in reading program features a mix of online and campus courses, though most instruction is delivered online. Students must also travel to campus during the summer for a two-week intensive course at the Canisius Literacy Center. The summer intensive includes an in-depth practicum experience that has students work alongside faculty to supervise district summer school literacy programs and a reading/writing camp on campus. Students also work with program peers and faculty members in group activities and discussion. Nova, based in Fort Lauderdale, Florida, maintains several extension campuses around the state and in several countries, along with a significant online program. The college’s master of science in education with a specialization in reading education is a research-based degree that integrates scientific evidence with practical classroom instruction strategies, giving students the skills to evaluate and instruct young readers. The 36-credit program includes two supervised practicum experiences, focusing on individual and group remediation strategies in K-12 classrooms. In both practicums, candidates must identify student needs and select the appropriate reading strategies to evaluate and address them. The NSU reading program directly aligns with the Florida Department of Education requirements, and graduates with state teaching licenses are eligible for add-on literacy certification. Unlike many online reading master's programs, the degree is also open to non-licensed students who are interested in education, and any student with a bachelor’s in an education-related field may apply. Olivet, a liberal arts college affiliated with the Evangelical Christian Church of the Nazarene, is based in Bourbonnais, Illinois. The master of arts in education: reading specialist degree is intended to transform practicing teachers into literacy specialists, capable of offering instruction to K-12 students of all ages, ability levels, and backgrounds. Master’s students learn to assess student reading issues, analyze testing data, and offer direction for reading initiatives that help children improve comprehension, vocabulary, fluency, and phonics. The curriculum includes topics in reading assessment design, differential instruction, and varied instructional approaches, along with strategies for using technology in the classroom. Before completing their master’s in reading, students perform a supervised practicum experience and complete a comprehensive creative research project. This 32-credit accelerated program is available entirely online and can be completed within 18 months. Rowan, founded in 1923 in Glassboro, New Jersey, operates a satellite campus in Camden, along with several online programs. The school’s master of arts in reading education: reading specialist program encourages students to develop a conceptual framework and practical classroom strategies for facilitating literacy development. Students gain advanced knowledge of reading processes, applicable to the administration of literacy programs in elementary and secondary schools and other clinical literacy settings. Rowan’s master’s in reading program emphasizes reflective practice and peer mentoring, and the clinical experience in reading course requires online students to tutor at the college’s campus reading clinic and analyze their experiences. Two other courses also require some campus meetings, but the rest of the curriculum is available entirely online. Students must complete a comprehensive final exam and a thesis project. The degree requires 33 credit hours and can be completed in six semesters. A master’s degree in literacy education prepares teachers to assess their students’ reading abilities and develop strategies to help them improve. Courses include using literature for literacy, diagnosing reading difficulties, and utilizing new technology in the classroom. Reading specialists and literacy coaches also act as leaders among teachers, offering strategies to improve literacy across the curriculum. Most programs require a capstone research project or thesis. Children’s Literature This course introduces students to children’s and young adult literature that is fun to read and helps develop literacy skills. This course includes works from around the world and across multiple genres. Reading Assessment Teachers use many methods to measure their students’ reading abilities. This course looks at how to interpret assessment data and plan proper interventions and instruction to improve student performance. Diagnosis of Reading Difficulties Struggling readers may have trouble decoding letters and words into sentences. Alternatively, the problem may be related to comprehending what has been read. Master’s students gain an understanding of the conditions that can contribute to difficulty in reading, such as dyslexia, attention-deficit hyperactivity disorder, and auditory/visual processing issues. Instructional Coaching Instructional coaching helps develop the leadership skills necessary to teach other instructors. This course includes methods and theories to improve peer coaching, professional learning communities, and lesson demonstration. Digital Literacy Digital literacy teaches students to question their sources, draw conclusions, and learn from a variety of digital formats. It is also important for students to understand how to properly cite their sources and behave responsibly and ethically online. Literacy education impacts a wide swath of educational programs, and a literacy degree can enhance a teacher’s skill in areas such as teaching ESL students or students with disabilities. In addition, the educational needs of students change as they grow; thus, literacy teachers may need to learn strategies to help different age groups, from elementary school to secondary education. English as a Second Language: Teachers in this specialty work with students who have no or little English language ability. They teach vocabulary and support reading development, helping their pupils succeed in classrooms where instruction is delivered in English. Early Childhood Education: Teachers in this concentration work with children through kindergarten, building a strong foundation in several core academic areas, including reading. These teachers also help students develop social and emotional skills. Instructional Coach: Instructional coaches take on leadership roles to develop the curriculum plans used in a school or across a school district. They are responsible for ensuring that mandated standards are met. They also coach classroom teachers about best practices and often administer continuing education sessions. Secondary Education: Secondary education teachers focus on students from fifth grade through high school graduation. They often specialize in a single subject, such as English. Elementary Education: Elementary teachers work with students from kindergarten through fifth grade. Some of these teachers specialize in a specific subject area, although many of them teach all major subject areas. Reading teachers bring an enthusiasm for reading to a classroom. They also have the patience and compassion needed to help struggling readers improve. Assessing a student’s current reading level and planning how to develop their proficiency requires an analytical mind and problem-solving abilities. A master’s in reading education prepares teachers for a variety of roles within their schools and community. While some states license and certify teachers with only a bachelor’s degree, many states require a master’s education. A master’s degree also leads to more job opportunities and career advancement, and many public schools pay teachers a higher salary if they hold an advanced degree. Kindergarten and elementary teachers provide the foundation for academics throughout their students’ lives. They also help students develop the behavioral and social skills needed for success in school and beyond. While only a bachelor’s degree is required to enter the profession, a master’s degree can provide higher wages and increased job opportunities. Kindergarten and elementary teachers With the greater demand for accountability in education, instructional coordinators have become increasingly essential members of education teams. A master’s degree is often required to hold this position. Additionally, an advanced degree provides subject area expertise that, when combined with teaching experience, sets a coordinator apart as an authority and valuable resource for other teachers. Reading specialists belong to a subset of special education and often work with students who are struggling with their reading abilities. These teachers assess each child’s abilities and areas of difficulty and design specialized plans to increase their students’ reading ability. While only a bachelor’s degree is needed to become a special education teacher, individuals who want to pursue specialized areas of instruction may need a master’s degree. Adult literacy teachers may work through government adult education programs or junior colleges and often participate in GED programs for adult learners. They assess the abilities of each student, determine areas where skills are lacking, and screen for possible learning disabilities. Teachers work with students who have a wide variety of reading abilities. Another subset of special education, ESL teachers work with students to overcome language barriers while learning English. Teachers utilize a variety of literacy, phonics, and linguistic instructional methods to help students gain the language skills necessary to be successful in their academic courses. While a bachelor’s degree allows entry into this field, a specialized master’s degree in literacy and a certification in ESL makes graduates more competitive in the job market. Public schools typically require literacy and reading teachers to apply for specialized certification in literacy. Certification generally requires graduation from a literacy education program that has been accredited by the Council for the Accreditation of Teacher Preparation; students may also need to pass a comprehensive exam in the area of reading education, such as the Praxis exam. Teachers can also seek certification in special education, ESL, or curriculum and instruction. Reading Specialist: This certification prepares teachers to work one-on-one or in small groups with struggling readers of any age. The curriculum also teaches graduates to use a variety of literature and nonfiction sources to improve their overall language arts instruction. This certification is useful for reading specialists and literacy coaches. Curriculum and Instruction: Literacy education graduates may have an interest in becoming instructional leaders or curriculum supervisors. Colleges often offer courses that focus on theories and practice for research-based instructional methods in addition to the literacy curriculum. English as a Second Language: ESL certification ensures that teachers can assist students in understanding spoken and written English as well as in speaking the language. Understanding both learning barriers and possible cultural barriers is essential for success. While a bachelor’s degree may be sufficient to begin teaching, many states require a master’s in reading education for the positions of reading specialists or instructional coaches. Georgetown University’s Center on Education and the Workforce found 44% of teachers continued their education and obtained a graduate degree. This additional education boosted their earnings by an average of 33%. 82% of these teachers work full-time, although part-time positions are often available. Instructional coordinators often find employment at elementary or secondary schools; junior colleges, colleges, or universities; educational support services; or within the state government (often in the state’s department of education). State governments tend to pay the most, while colleges and universities pay the least. The overall median wage of $62,460 is well above the median wage for all workers in the U.S. (i.e., $37,040). Graduate schools are interested in applicants who demonstrate the knowledge and abilities needed to succeed in a master’s program. Schools often require students to take the Graduate Record Exam (GRE) or the Miller Analogies Test (MAT). The GRE includes three parts (i.e., writing, verbal reasoning, and quantitative reasoning) and is four hours long. Teacher education programs often accept the MAT in place of the GRE. The MAT has one section with 120 questions and is one hour in length. The test asks students to complete incomplete analogies. Both the GRE and MAT attempt to measure a student’s general knowledge and abilities. Students can prepare by taking practice tests to become familiar with the question formats. Along with satisfactory scores on standardized tests, schools look at academic achievement in undergraduate programs; applicants are often required to have a 3.0 GPA or higher. Some programs also require students to have a few years of successful experience as a classroom teacher. Accreditation ensures that an educational program provides a rigorous curriculum and offers the resources necessary for students to succeed in their field. Regional accreditation is the oldest form of educational certification and provides a stamp of approval for a college or university as a whole. Regional accreditation is typically preferred when seeking to transfer credits or gain certification from licensing agencies. The United States has seven regional accrediting bodies, with membership determined by geography. Together, these make up the Council of Regional Accrediting Commissions (CRAC). National accrediting commissions also exist, but credits from schools with national accreditation may not transfer to colleges with regional accreditation. The United States Department of Education does not recognize all accrediting agencies. Thus, it is important to research any potential school’s accrediting agency by visiting the Database of Accredited Postsecondary Institutions and Programs. In addition to school-wide accreditation, prospective teachers should ensure that the Council for the Accreditation of Educator Preparation (CAEP) has accredited their program. CAEP recognizes programs that meet rigorous academic standards for professional teachers. States often require this seal of approval when granting teachers licenses. Teachers pursuing an affordable master’s in literacy education have access to numerous funding options, from tuition discounts and grants to scholarships and service-connected awards. Loans may also be an option. Teachers in high-need subjects and school systems may qualify for loan forgiveness after teaching for an agreed upon time. The first step to financing a master’s degree in reading is to complete the Free Application for Federal Student Aid (FAFSA). The FAFSA determines a student’s eligibility for any need-based awards, such as grants or need-based scholarships. Public colleges and universities often offer tuition discounts to teachers from public schools in their state. These awards may be limited to only a few hours a semester; however, many teachers complete a master’s degree while continuing to teach full-time. Merit-based scholarships or scholarships aimed at increasing the number of professionals in literacy coaching or ESL may also be available. Statewide reading associations and individual colleges often have scholarship funds dedicated to literacy education students. The tables below include a few scholarships available to students pursuing a master’s degree in literacy education. The South Carolina State Council of the International Reading Association offers this scholarship to students pursuing graduate-level work in education. Eligibility Requirements: Applicants must have at least two years of successful teaching experience as well as letters of recommendation from their current employer, a professor, and/or a member of the local South Carolina International Reading Association council. The Patterson Family Foundation funds scholarships at 22 colleges across the nation for students enrolled in graduate-level education programs. Eligibility Requirements: These scholarships are for students who plan to teach and can demonstrate financial need. Reading Recovery focuses its efforts on first grade teachers who teach children with reading difficulties. Eligibility Requirements: Awards are made to school districts; districts choose a teacher to take part in a full-time, one-year postgraduate course at a Reading Recovery training center. This New Mexico International Literacy Association scholarship supports members who are furthering their education in literacy. Eligibility Requirements: Membership in the association is required. Students must also be accepted or enrolled in a reading, language arts, or literacy program and live or teach in New Mexico. Awarded by the Virginia State Reading Association, this scholarship supports graduate students seeking an advanced degree in reading or literacy. Eligibility Requirements: Candidates must be a member of a local council, the Virginia State Reading Council, and the International Reading Association for at least one year before applying. Applicants must be employed in a position with a reading focus and enrolled in graduate-level courses at a Virginia college or university.